JUNE 21st – CAROL LIPNIK & SPOOKERAMA – Authentic Coney Island parlor punk | Allied Productions, Inc.
Avant-siren chanteuse Carol Lipnik with her wildly eclectic accompanist, the acclaimed keyboardist Dred Scott, conjure an authentic Coney Island Parlor Punk music that is by turns phantasmagorical, carnivalesque, gleefully macabre, and irresistibly compelling. Lipnik’s dramatic 4-octave voice coupled with her poetic, genre-defying songs (many from the point of view of lovelorn beasts and freaks like The Creature From The Black Lagoon and The Werewolf) are thrilling, chilling and heartbreaking. 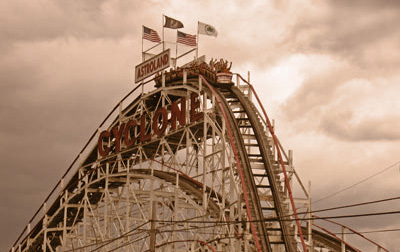 With projections of vintage Coney Island footage by Peter Cramer!! and Spookarama’s brand of blues, mixing voodoo and psychedelic. This concert is presented as part of the annual city-wide celebration of music, Make Music NYC. LPV events are made possible by Allied Productions, Inc., Green Thumb/NYC Dept. of Parks, Materials for the Arts; NYC Dept. of Cultural Affairs, NYC Dept. of Sanitation & NYC Board of Education. Film & Exhibition support from The New York State Council on the Arts, a state agency.